FactCheck.org has been awarded the 2015 Webby for best Political Blog/Website by the International Academy of Digital Arts and Sciences. 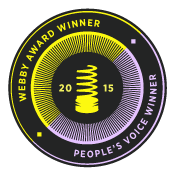 And thanks to our amazing readers, we also won the People’s Voice Webby in the same category. This is the second consecutive year that FactCheck.org has won both awards, which honor the best of the Internet. We are now a six-time winner of the judge’s Webby award and an eight-time winner of the People’s Voice award as voted by the public. The other finalists for best Political Blog/Website were Politico, New Zealand-based On the Fence, the Rolling Stone feature “America’s Gun Violence Epidemic,” and past winner Truthdig. Winners will be honored at the 19th Annual Webby Awards on May 18 at Cipriani Wall Street in New York City. The event will be available for viewing the following day on www.webbyawards.com. As always, we would like to thank the academy and our loyal followers for this honor.